A dozen years ago, organic farming and produce was a fringe movement. Supermarkets had begun to establish dedicated little sections – a metre across – for organic produce, where they displayed a rag-bag assortment of jams, biscuits, tinned veg and usually a few bottle of wine. Invariably the wine that I tried was of middling quality, expensive, and certainly in itself no great advert for organic production being a guarantee of quality. Today, organic food is much further forward in the public consciousness, and certainly there’s an awful lot more of it about. It has burst out of its ghetto too, and the organic produce takes its place alongside its non-organic peers, competing directly with them. Wine is the same. Today, a lot of wines are organically produced, a small number take this a stage further into biodynamics and a large number whilst not organic, are made from grapes farmed with minimal use of chemicals. Whilst ‘organic’ on a wine label may once have signalled a quirky but possibly not very good niche product, today it is more often associated with the most careful and thoughtful wine producing companies. Organically produced wines mean that no synthetic herbicides, pesticides or fertilisers are used in the vineyard. Vegetarian wine are not necessarily organic, but carry a guarantee that animal products have not been used in their creation. Though it may seem strange that fermented grape juice could be anything other than vegetarian, animal-derived products have traditionally been used in the wine-making process, particularly to fine or clarify the wine. Two common fining agents are isinglass, which is derived from fish, and gelatin, which can be derived from animal bones. Vegetarian wines are fined with non-animal products. I decided to put a whole batch of organic and vegetarian wines to the test. Detailed notes are below, but generally speaking this was a really sound selection of almost 20 wines, that were on the money in terms of their price-to-quality ratio. It seems that organic and vegetarian wines are now competing on a level playing field, and doing a pretty good job at that. 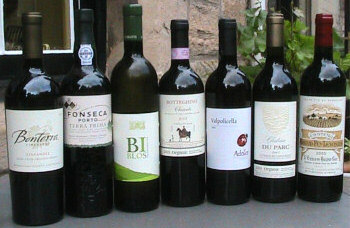 All wines in this report are suitable for vegetarians, and organic wines are indicated in the text. Suitable for vegetarians, this sparkling PG from northern Italy pours a pale lemon colour with plenty of lively froth. On the palate there’s attractive, peach and ripe red apple fruit, with a touch of toffee in the background. On the palate it is dry and citrussy, with the fruit staying pretty well-organised through the mid palate, the gentle effervescence adding some edge with just a trace of something slightly bitter right on the finish. Forget that though: at this price it’s a party starter of some style. 85/100. £3.99, Aldi. There’s a delicate yeastiness and nutty note on the nose of this 12.6% alcohol Chenin, which comes from a brand that is 40% owned by an employee trust, and where all workers come from disadvantaged backgrounds. Ripe apple, and even a hint of more tropical fruit fills in. On the palate this is juicy and herbaceously fresh, with a little grassy note and plenty of crisp, lively fruit. A fairly simple and straightforward wine, but a little hint of honey and toast does add some interest. 86/100. £5.99, Oddbins included in a ‘3 for £15’ offer, 17th August until 4th October 2009. Grapes are not listed on the label for this Mendocino County wine, though in fact it is a blend of many grapes including Sangiovese, Zinfandel and Syrah. A deep-coloured rosé, there’s a note of cranberry and cherry, a hint of spice and a certain tea-like quality. On the palate it is full of strawberry pulp fruit, underpinned by a citrussy acidity and still showing little herbal and leafy qualities. Layered stuff, and note that if there is still some on the shelves by 9th September, Waitrose will cut the price to £5.99. 87/100. £9.99, Waitrose. This Stellenbosch Pinotage has a nose of coffee and dark berry fruits, though there is a little tell-tale note of burning rubber that is typical of some Pinotage wines. On the palate there’s a sweetness to the fruit and masses of spice. Creamy raspberry fruit dominates, though I have to say I find a little bit of a resinous quality to this that is distinctively Pinotage, but not entirely harmonious, right in the finish. 85/100. £5.99, Oddbins included in a ‘3 for £15’ offer, 17th August until 4th October 2009. An organic blend of Syrah, Mourvèdre and Grenache, this has a bright, raspberry and cream fruit with a touch of something herbal and certain jammyness. On the palate that mix of sweet, juicy red fruit with a little herbal lift continues, leading onto a dry, savoury finish of gentle tannin and good acidity with lots of pepper and spice kicking in. 87/100. £5.99, Marks & Spencer. This Aconcagua Cabernet has a wonderfully tight focus, with pure blackcurrant fruit and just a swirling hint of smoky spice. On the palate there is a juiciness to this, with plenty of lively acidity and firm tannins shoring up the inherent sweetness of the black fruit. Drinking really nice this and a beautifully made wine. 88/100. £6.99, Oddbins. Organic Tempranillo with a touch of Graciano is the recipe for this fresh, fruity, modern Rioja. Strawberries and cream, with a little lick of denser, more plush cassis aroma, leads on to a palate that is medium-bodied and quite grippy, with a firm, rustic edge to the tannins and a smoky, charry edge of spice that builds through to the finish. Quite a lively handful this, much grippier than some Riojas, but though bold and flavourful maybe lacks a little mid-palate fruit. Needs food. 86/100. £6.99, Marks & Spencer. This 100% Sangiovese is made from organically-grown grapes from vineyards close to Siena in Tuscany. The nose has a cedary, sweet-tobacco note over rounded cherry fruit with a hint of black olive. On the palate this is quite crisp and racy, with the typically bright and juicy acidity of the grape, and a nice, subtle underpinning of smoother, richer fruit, spiciness and some earthy softness of older oak. This is a really nice Chianti that’s also quite long. 88/100. £7.99, Marks & Spencer. McLaren Vale is a hotspot for big, burly Shiraz wines, this one named after the tree frogs that have repopulated the Gemtree farm as part of their environmental programme. It has a deep-set blueberry nose with a great deal of plush, ripe fruit character and undertones of espresso and wood smoke. The palate has that super-ripeness again, with a big, solid fruit core that is dense and bittersweet, a certain creaminess to fruit and texture playing against burly tannins and a bit of alcoholic heft. 89/100. £7.99, Oddbins. A vegetarian-suitable Bordeaux from a fine vintage, this St Emilion has 70% Merlot in the blend, along with the two Cabernets. It has a soft, earthy, sweet, damp leaves nose with plummy fruit and a bit of cedar beneath. On the palate it is quite bold and fleshy, with good fruit – lots of blackcurrant and bittersweet plum and plum skins, with the tannins ruffling the surface and balanced acidity. The spice and cedar of the oak asserts in the slightly dry finish. A characterful Bordeaux at a good price. 88/100. £9.99, Aldi. There’s a chocolate and plum richness and enveloping smoky darkness about the nose of this wine, where ageing in French oak barrels has only added cedary nuances. On the palate this delivers a big, fairly straightforward rush of bittersweet black fruit, with blackcurrant and black plum nestling down amongst ripe, chunky tannins, that smoky, savoury oak and good acid structure. Chewy and dense Merlot this, with a long, spice-infused finish. 88/100. £10.99, Waitrose. The Adalia brand name is derived from Adalia bipunctata, the ladybird, which is one of the main biological methods used by Corte Sant’Alda to control aphids in the vineyard. The wine has a creamy, juicy, strawberry and raspberry fruit character with a nice suggestion of schisty minerality. The palate has nicely-pitched fruit that is sweet and ripe, but sharpened and balanced by crisp acids and a tart, cherry-skin tang. I have to say £10.99 looks a little steep for this wine delicious but ultimately simple wine, and the mixed-case price of £8.79 makes more sense. 87/100. £10.99, Oddbins. Fonseca’s Terra Prima is an organic Port, and the spirit used to fortify the wine was also from organic grapes. It is a deep, rich ruby, aged in vats, and has silky-smooth aromas of crushed red berry fruits and chocolate, with little herbal nuances. On the palate that herbal quality is still there, but some pure, velvety, cherry and plum fruit fills in nicely, the subtle sweetness developing but staying balanced by a certain acidity and a fairly nimble, lighter-bodied character. A spicy finish too in a style that is not heavy, and very sippable. 89/100. £14.99, Waitrose, Bibendum, Luvians, Peckham & Rye.